Join us for a fun filled educational adventure with our expert field guide/instructors while exploring the natural beauty of Canyon Country. 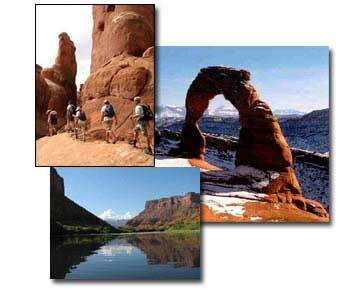 We conduct van, hiking and river tours on the lands in and around Arches and Canyonlands National Parks and on the Colorado River near Moab. Whether you are curious beginner or serious student MoabGeoTours offers the educational adventure for you. Immerse yourself in the spectacular landscapes of the Canyon Country, examine the forces that shaped the region, recognize the common rocks and minerals and how they relate to the environment in which they formed, see evidence of life forms from the past and learn about the past and present mining activities of the area. Guided tours are conducted at a beginning through advanced level. Tours include wildlife, animal track and plant observation and identification, and allow time for photography and quiet reflection. Conservation Adventures is our one stop center for service programs with an Outdoor Adventure component. 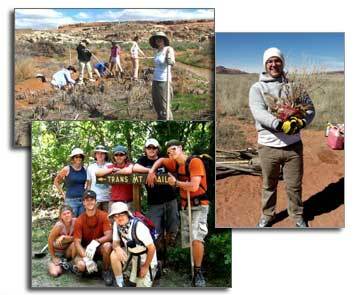 We feature Alternative Breaks for colleges and universities, Moab Volunteer Vacations, which are perfect weekend programs for families, couples and individuals, and custom corporate retreats and team building. Each of these offer volunteer projects which actively involve you in hands-on efforts to restore desert landscapes for critical wildlife species such as Desert Bighorn Sheep, migratory birds and pollinators like the Monarch Butterfly. After your service project we will have available one or more of the following: raft and kayak trips on the Colorado River, hiking in Arches or Canyonlands National Parks or a Geology tour of the Moab area. Contact us to build your own program or for more information. Our stewardship focuses on the magnificent wildlands and rivers defined by the Colorado River basin – an area that includes Arches, Canyonlands and Grand Canyon National Parks, Grand Staircase Escalante National Monument and other public lands managed by the NPS, Bureau of Land Management and US Forest Service.